A website could be distinguished on its different purposes, beneficiaries and their requirements. In digital world business organizations are highly stimulated by globalization and technological changes. Now the need for introducing your company requires as much as physical presence as online presence. Internet over last few decades has blown a tornado, shaped the world tremendously. It has broken numerous traditional practices and reshaped many with new trends. Once upon a time corporate brand identity communication was narrowly confined into print media and few electronic media only. Enormous cost involved into these promotional media let most of the organization confined into small geographic coverage, hardly crossing the national boundaries. Even only a handful companies were able to reach their coverage thoroughly within the national boundary itself. A nicely and appropriately designed and developed website now a days has no such limitation of geographical coverage. With invention of high speed and affordable internet technology a corporate website could be reached and accessed from almost every corner of the world. So once upon a times debate of “rationality of investment on website” has completely blown up with the high tide of internet explosion. Now a company sit in backbench if they have poorly designed website, let alone those who have no website, they are completely out of the class. So decision about a website is not a matter of choice rather it is a must for any smart business. Complete exploitation of high speed internet technology etc. Depending upon the need company website could be of different types but their basic requirement is establishing brand identity, information sharing with stakeholders and reaching target markets eliminating geographical hindrance. Whenever you have decided about a website you need a lot of consideration to look for to make the design worth of investment. A good and rightly designed and developed website is a combined effort to several activities in a single umbrella. We Web Host BD is an expert who addresses all those issues with care while considering a dream website that worth your investment. Our expertise and authority starts from the very beginning of a website of domain hosting to web designing and development. 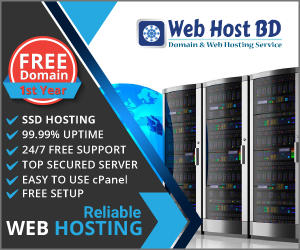 We are the current market leader in domain hosting business, subsequently we Web Host BD know what would make you achieve the crown in online presence because we are achievers. A wholesome and fruitful company website has to consider a lot of things, it starts from meticulous planning of web design and development. In second stage the company has to identify the load of its traffic and content. Depending on it the hosting plan should be identified. Security issue of the website in hosting plan has to be figured out. Photography, Videography, computer graphics and other content preparation for feeding website. Static website – The users who require minimum changes into their website periodically and request professional hand for any amendment only. Dynamic website- The users who require frequent changes into their website periodically and they themselves do amendment and servicing. Step 1: We discuss with client to pay heed to their requirements and conceive their feelings and requirements. Step 2: We offer preliminary prerequisites to be done and related budgets and alternatives. Step 3: If client accept our offerings then we offer them to choose any template among few alternatives and set the magnitude of works and timeline. Step 4: We take consent of client before final submission of the works and make required amendment. Step 5: We finally submit our project and give required training along with a 3 months after sales service.